A two-level construction, the main portion of which was the viaduct which connected a now-collapsed tunnel to a road to town over a now-dry riverbed. It was a distinct sign of civilization as you approached town that travelers would come through this well-maintained tunnel and across the stone brick viaduct with the burbling of water overhead in the elevated and significantly narrower aqueduct which transports water from a clear mountain lake down into the rich part of town. As always, the one constant of any world is change. During the Galreth incursion 172 years ago, a siege of the city forced the collapse of the tunnel in order to both restrict access to the city as well as to crush the infantry unit using that approach. The river beneath has changed courses, now rerouted into the city proper and reducing the demand for the aqueduct – although the aqueduct’s clear glacier water is still appreciated by those in the noble district. 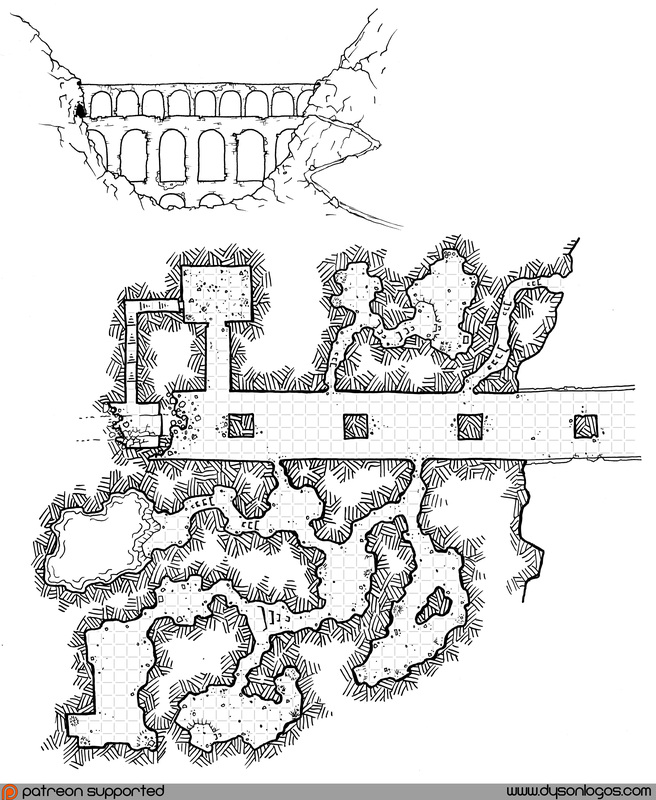 And now other creatures have set up residence in the old viaduct tunnel – initially ghouls dragging out corpses from the deadfall and carving small niches and tunnels for themselves, and then later smaller cunning humanoids who have killed off the ghouls and expanded their little niches and caves into full warrens for themselves along with an upper level lookout where they can track the approach of hostile forces along the viaduct. One of the caves connected to by these creatures living in the walls contains a sunken pool of water – runoff from the aqueduct that works through the old cracked and ruined stone from the collapse of the viaduct tunnel structure. Other caves are used as living areas and food storage. A few of the humanoids also work as animal herders, keeping a small flock of mountain goats in the area and getting to and from them via the mountainside lookout post they have. One of the only hints locals have of the existence of these creatures is the occasional signs of where they slaughtered one of their goats on the hillside before bringing the carcass into the caves. But what brings the adventurers to the aqueduct & viaduct? The old collapse of the tunnel has continued to settle over the years, and the aqueduct source has been blocked by shifting stone. While the aqueduct tunnel is probably too small for most people to work in it, a maintenance room remains in the viaduct area that includes an old door, long rusted shut, that leads up to a maintenance area for the aqueduct itself… right where the collapse has taken place.